The arrival of the 1970s saw Yutaka Takanashi assuming the role of the “hunter” to a greater extent, this time in the greater Tokyo area. Driving through Tokyo and its surrounding area, he shot industrial wastelands, fields and power stations, inner-city buildings and highways – all true to the Provoke aesthetic. The images are sombre, frequently canted and occasionally blurred, often with very stark contrasts, whereby it is the blackness of the pictures rather than the light that seems to hold sway. These new shots, together with works from Provoke magazine and the Tokyo-jin series from the mid-1960s, form the basis for Yutaka Takanashi’s first independent publication, Toshi-e (Towards the City). The intricately designed publication consists of a black box and two books: a small “notebook” of yellowish paper and, on top of it, a magnificent volume of photographs in a black clothbound cover adorned with a polished metal plate. The grainy photographs are printed in gravure on heavyweight paper. While Tokyo-Jin is defined by its clear reference to urban life in the Japanese capital, Toshi-e, featuring photographs from the late 1960s and early 1970s, sees Takanashi cutting his ties with Tokyo, citing no specific times or specific places. Unlinked to any particular locations, the unnamed shots combine to create an image of a country that has metamorphosed into a dehumanised, life-choking environment. All of Japan appears to be in the throes of urbanisation or changing into an industrial landscape. 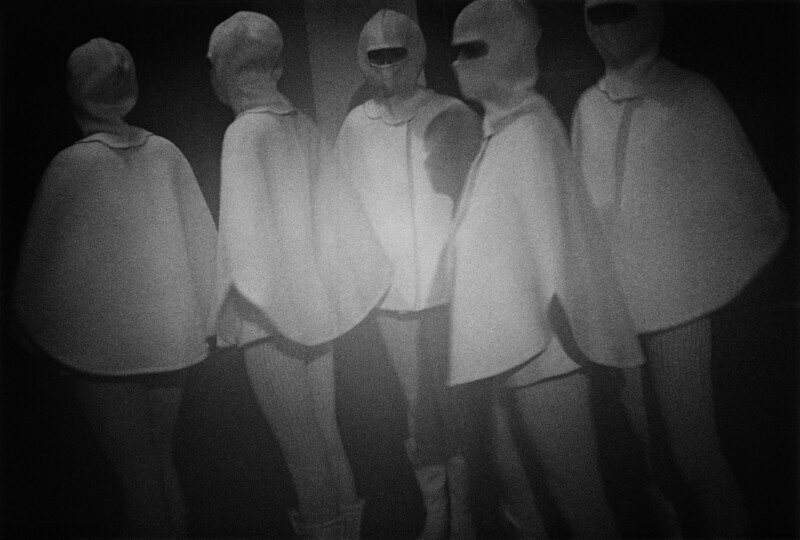 People now only appear in the wings and, if seen at all, look like aliens in futuristic clothing. In spite of the vast differences in designs, the boundaries between Tokyo-Jin and Toshi-e are fluid. Toshi-e contains a number of images from Tokyo-Jin and both series see Takanashi touch upon the same subtheme – often through the barest insinuations – namely the encroachment of US consumer culture on everyday Japanese life. We see for instance a solitary man sitting by the sea with, on closer inspection, a Coca-Cola logo on his T-shirt; or a girl standing in front of a temple sporting a pair of Ray-Bans. Today, Toshi-e is seen as both the peak and the endpoint of the Provoke era. It is well worth noting that, with the gloomy vision of the future conveyed in Toshi-e, Takanashi flew in the face of the 1970s zeitgeist. The critical debate that took place in the 1960s about the collision – nowhere more apparent than in Tokyo – between tradition and modernity and between homegrown and Western culture was, in the following decade, drowned out by a consumer culture that crept into all areas of life. Yutaka Takanashi’s photographer colleagues turned their attention to other themes. By as early as 1969, Shomei Tomatsu had already turned his back on Tokyo in favour of Okinawa (photo books Okinawa Okinawa Okinawa, 1969, and Pencil of the Sun, 1972). In his masterpiece Bye Bye Photography (1972), Daido Moriyama explored the possibilities and boundaries of photography as a medium and published, among other things, shots taken on a trip to North Honshu in Tales of Tono (1976). The general focus of Japanese photography was now on rural Japan with its villages and small towns: among other things, Kazuo Kitai’s Mura-e [Towards the Village, 1980(( In 1975, Kazuo Kitai received the newly created Kimura Ihee Award for Mura-e.))] took up the counterposition to Toshi-e, Hiromi Tsuchida’s debut “Gods of the Earth” (1976) focused on people in Japan’s hinterland, and Issei Suda’s “Fushi Kaden” (1978) showed people at traditional festivals in various prefectures.